Today. 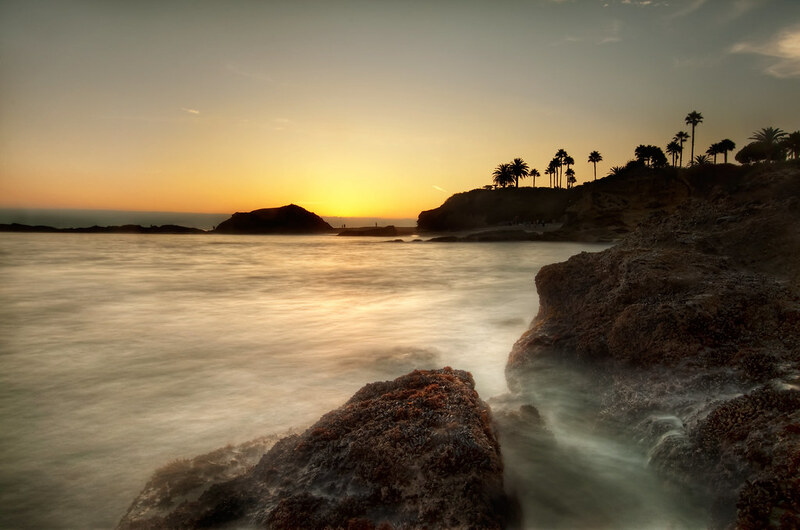 Another capture from Laguna Beach. Patrick, I have to confess that this shot wasn't taken on one of my runs :-(, but about 90% of the shots on here are. As far as my workflow goes, I may post an entire tutorial here soon, so be on the lookout for that. The abridged version is Lightroom for white balance, Photomatix for HDR, Photoshop for fixes and contrast. For this shot specifically: After creating the HDR in photomatix I brought it into photoshop. There I fixed some waterspots that got on the lens. Masked in some of the original exposures that got messed up by photomatix. I then added some Nik Color Efex Tonal Contrast to the rocks, and some Nik Color Efex Glamour glow to the entire image. Then I sharpened the image. There was a lot of trial and error. Also, this image was a very strange one for me processing wise. You'll notice the shadows clipping in the background, the far rock is completely black. In a "true" HDR photo you won't see this. In the photomatix version of this image that portion of the shot was actually not clipped, you could make out the color and detail of the rock. I actually brought back in the original darker image using masking in photoshop, and essentially un-HDRd the image because I thought it looked better and brought a little mystery to the scene. Thanks for your explanation! I assume the photo number 258 received the same treatment? I like it even better than this one. Also, I'd like to thank you a lot for taking your time and explaining this to me. It's not something I take for granted. And I'm always curious when I see photos I really like. I actually downloaded the Nik Color Efex trial but I am not as overwhelmed as I thought I would. Maybe I need to better figure out how to use it in the right way. I don't think that an HDR photo always needs to be 100% HDR, HDR is just a tool among others (contrast, etc.) and should be used when it helps the photo and be left out when it doesn't add anything to it. So I'm cool with your decision to let the background rocks clip, I think you are right, it does look good this way. I am really looking forward to a tutorial if you are planning on doing one! Keep on running - or at least keep on taking pictures!